I hope you read this somewhere (because I’m finding every way to get this to you)… It’s a birthday letter, and it’s really heartwarming. I hope it makes your day brighter and spurs you on! 파이팅 키 순배! You are an angel. Every time I see your smile, I smile. Every time I see you looking tired, my heart hurts. Every time I see your tears, my eyes sting. Every time I see you wearing something that only YOU could wear and still look good, I feel proud. Your voice, whether your talking, singing, whining, crying, humming, or whatever, is music to my ears. I wish I could hear that voice in person. It’ll happen one day. You are beautiful. Never let anyone tell you otherwise. Not that you would believe them if they did tell you otherwise; you know you’re fabulous and perfect. I love that about you. I learned how to be confident from you. Thank you. Well Mr. ‘91 liner, you’re 20 now, (21 international age). How does it feel? Do you feel any different? Probably not. You still look like a little boy, and I bet you still feel like a teenager. I wish I could give you a real present, not a little ramble on a website you probably don’t even go on. (It’d be awesome if you did though…) But hey, at least I remembered. I was thinking about you all day. Is Jonghyun gonna give you a really good gift? I bet he is. In the bed. lol i jk. Key, I love you. Unfortunately, I’m like 6 years younger than you, I’m not Korean, I don’t live anywhere near Korea, and the chances of us meeting are slim. The chance of you falling in love with me are slimmer still. I won’t lose hope though. And I’ll always love you. Even when I get married and have kids, I’ll bring out your Ring Ding Dong photos and sigh over them and squeal over them and fangirl over them just like I do right now. Thank you for being you. Thanks for loving your fans. Thanks for your hard work. You’re talented and amazing, but you already knew that. 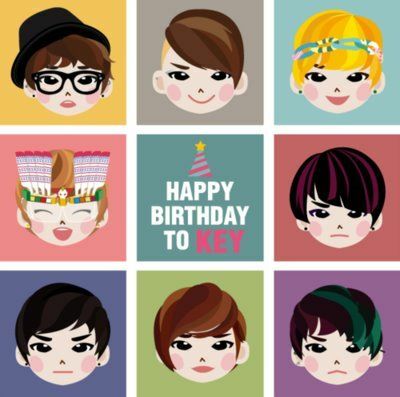 Posted on September 23, 2011, in Uncategorized and tagged HappyKeysDay, 키Day, Key, Kim Kibum, SHINee. Bookmark the permalink. Leave a comment.